French Orientalist; born at Adrianople Dec. 15, 1827. While a teacher in Jewish schools, first in his native town and later in Bucharest, he devoted his leisure to the study of Oriental languages and archeology, in which he became proficient. In 1868 he was sent by the Alliance Israélite Universelle to Abyssinia to study the conditions of the Falashas. His report on that mission, which he had fulfilled with distinguished success, attracted the attention of the French Institute (Académie des Inscriptions et Belles-Lettres), which sent him to Yemen to study the Sabean inscriptions. Halévy returned with 686 of these, deciphering and interpreting them, and thus succeeding in reconstructing the rudiments of the Sabean language and mythology. 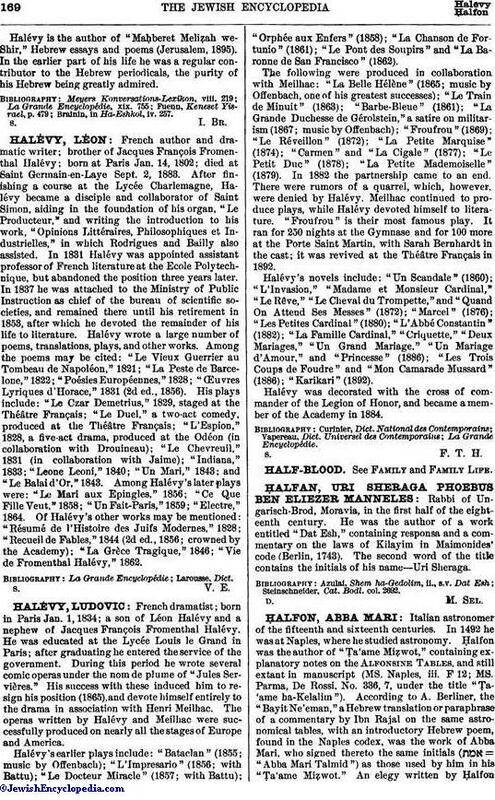 Since 1879 Halévy has been professor of Ethiopic in the Ecole des Hautes Etudes, Paris, and librarian of the Société Asiatique. Halévy's scientific activity has been very extensive, and his writings on Oriental philology and archeology, which display great originality and ingenuity, have earned for him a world-wide reputation. He is especially known through his controversies, still proceeding, with eminent Assyriologists concerning the non-Semitic Sumerian idiom found in the Assyro-Babylonian inscriptions. Contrary to the generally admitted opinion, Halévy put forward the theory that Sumerian is not a language, but merely an ideographic method of writing invented by the Semitic Babylonians themselves. 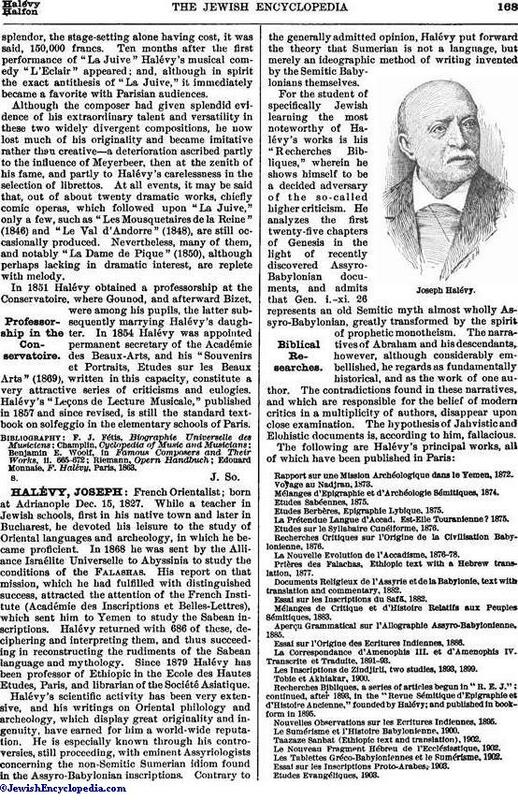 For the student of specifically Jewish learning the most noteworthy of Halévy's works is his "Recherches Bibliques," wherein he shows himself to be a decided adversary of the so-called higher criticism. He analyzes the first twenty-five chapters of Genesis in the light of recently discovered Assyro-Babylonian documents, and admits that Gen. i.-xi. 26 represents an old Semitic myth almost wholly Assyro-Babylonian, greatly transformed by the spirit of prophetic monotheism. The narratives of Abraham and his descendants, however, although considerably embellished, he regards as fundamentally historical, and as the work of one author. The contradictions found in these narratives, and which are responsible for the belief of modern critics in a multiplicity of authors, disappear upon close examination. The hypothesis of Jahvistic and Eiohistic documents is, according to him, fallacious. Rapport sur une Mission Archéologique dans le Yemen, 1872. Mélanges d'Epigraphie et d'Archéologie Sémitiques, 1874. Etudes Berbères, Epigraphie Lybique. 1875. La Prétendue Langue d'Accad, Est-Elle Touranienne? 1875. Etudes sur le Syllabaire Cunéiforme, 1876. Recherches Critiques sur l'Origine de la Civilisation Babylonienne, 1876. La Nouvelle Evolution de l'Accadisme, 1876-78. Prières des Falachas, Ethiopic text with a Hebrew translation, 1877. Documents Religieux de l'Assyrie et de la Babylonie, text with translation and commentary, 1882. Essai sur les Inscriptions du Safã, 1882. Mélanges de Critique et d'Histoire Relatifs aux Peuples Sémitiques, 1883. Aperçu Grammatical sur l'Allographie Assyro-Babylonienne, 1885. Essai sur l'Origine des Ecritures Indiennes, 1886. La Correspondance d'Amenophis III. et d'Amenophis IV. Transcrite et Traduite, 1891-93. Les Inscriptions de Zindjirli, two studies, 1893, 1899. Recherches Bibliques, a series of articles begun in "R. E. J. "; continued, after 1893, in the "Revue Sémitique d'Epigrahie et d'Histoire Ancienne," founded by Halévy; and published in book-form in 1895. Nouvelles Observations sur les Ecritures Indiennes, 1895. Le Sumérisme et l'Histoire Babylonienne, 1900. Taazaze Sanbat (Ethiopic text and translation), 1902. Le Nouveau Fragment Hébreu de l'Ecclésiastique, 1902. Les Tablettes Gréco-Babyloniennes et le Sumérisme, 1902. Essai sur les Inscriptions Proto-Arabes, 1903. Halévy Meliẓah we-Shir," Hebrew essays and poems (Jerusalem, 1895). In the earlier part of his life he was a regular contributor to the Hebrew periodicals, the purity of his Hebrew being greatly admired. Brainin, in Ha-Eshkol, iv. 257.